I had the urge to bake cookies for my hair dresser this morning, but at the last minute I discovered I was out of granulated sugar. What to do? Use all brown sugar. I hadn’t made these cookies in a long time, but the dough was so perfect and the cookies so handsome I had to wonder why I didn’t pull out this recipe more often. In the end, handing them off to my hair dresser was awkward. She didn’t seem that excited (I think she likes savory things better anyway) but was gracious and put them in the back. Meanwhile, I was just glad I had some more dough at home to bake some for myself. Looks like the old appetite is back. This really is a good recipe. It’s adapted from The Once Upon a Tart Bakeshop book where they say cookies made with this dough sell out every single day. They’re not fancy cookies, but they are definitely bakery quality, fat, rich, and just very good all around. Plus you only have to use brown sugar, so if you find yourself out of granulated sugar and dying to make cookies, this recipe is a winner. TEXTURE NOTES — These have less sugar than most chocolate chip chip cookies which means they don’t spread nearly as much. They’re also not as chewy as some sugarier cookies, but rather kind of sandy — not hard, but soft textured with kind of a sandiness you feel in the bite. The edges are definitely crispy. Here’s an old photo of how big they are in relation to the baking sheet. 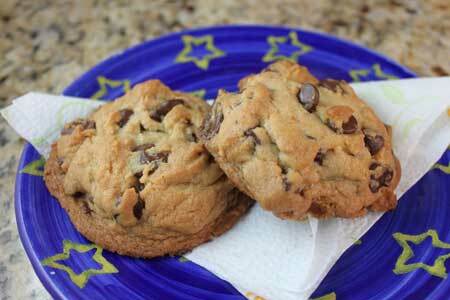 A chocolate chip cookie made with brown sugar. In bowl of a stand mixer, beat the butter with the paddle attachment until creamy. Add the brown sugar and beat butter and sugar for about 3 minutes. Reduce speed to medium low and add eggs one at a time beating just until combined. Beat in the vanilla, baking soda and salt (scrape sides of bowl often), then add the flour and continue mixing on low speed until it’s blended. Mix in the chocolate chips. 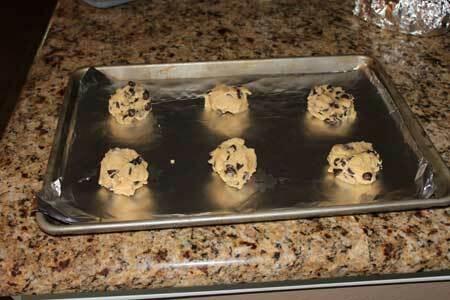 Using a 1/4 cup measure, scoop up about 20 mounds of dough and lay them on a non-stick foil lined cookie sheets. Chill for 2 or more hours. 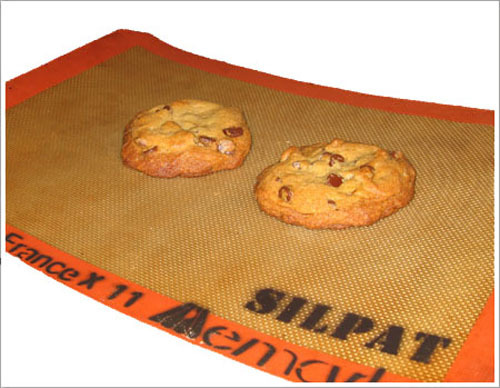 Preheat oven to 350 degrees F. Line 2 cookie sheets with non-stick foil or parchment paper. Arrange cookies 6 to a sheet and bake one sheet at a time on center rack for about 18 minutes or until cookies are nicely browned. Thanks Jessica. Glad you enjoyed the cookies. Made a half batch of these last night, but made them a little smaller and skipped the chilling (husband was in a hurry for cookies). They were fantastic! I just email this recipe to my BFFL its so good!!!! Im the COOKIE MASTER!!!! Anna’s did (texture, etc). we thought they were great. I’ll definitely be using this recipe again. Brown sugar is the best sugar to make cookies with, great for Millie’s style cookies too! I made chocolate chip cookies the other night and was almost out of brown sugar and had to use mostly granulated sugar. And they came out fine. Yours look delicious! Sorry about the awkward moment. Why can’t people just say thank you, smile and move on? I love using brown sugar in CCC. The darker the better. The Tres Leches cakes was great by the way. Apparently my boys liked it, because they left dirty dishes in the sink from it late last night. Interesting. I’ll have to try those. 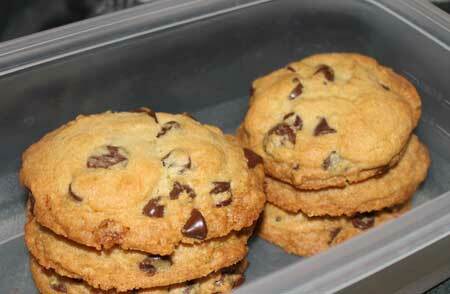 I love testing out different chocolate chip cookie recipes. Now you’ve got me all excited about these chocolate chip cookies. Have to chime in – I’m lucky in the hairdresser department, my hairdresser ordered cupcakes from me for a baby shower she was hosting and she offered me a trade in exchange…two free haircuts! Louise, having tasted your cookies I can say it truly is their loss. Then again, it’s probably just taking them time to get their act together. Maybe you should just make cookies for the nice lady at Wal*Mart who contacted the bake sale ladies for you. Thanks for the awkward cookie gifting empathy! You just never know. I made some for my ear doctor once thinking that would be awkward, but he and the staff really loved them. Teachers always love them, the neighbors (usually) love them, but the hair dresser thing was just weird. Maybe it’s all the chemicals in the air. Anyway, I went ahead and added some more notes on the texture above. Good to hear that your appetite is returning! Argh! I hate it when I bake stuff for people and there is that awkward ‘oh you REALLY shouldn’t have moment.’ But usually even if the person doesn’t want it, someone else REALLY wants cookies/cake/muffins so I don’t feel bad. Another Anna recipe on my must-try list! I often only have brown sugar on hand. I gave cupcakes to my aerobics instructor a while back and it was awkward. She always talks about how much she loves cupcakes. She was kind of like, ohhh thanks! and that was it. I think if someone brought cookies or cupcakes to me I would be overly nice and excited. Good to know because inevitably, there will be times when I’m out of granulated sugar so it’s nice to know this is an option. I, too, have a Brown Sugar CC cookie recipe that i adore, there is just something magical about brown sugar that intensifies a cookie taste and texture! Oh, and btw, I did the same thing with my hairdresser a while back. I was wondering if she thought I poisoned the cookies. Decided I will just stick to giving goodies to friends and neighbors who appreciate them. WELCOME BACK! :). Happy you’re appetite has returned and as a bonus: craving cookies (always a plus :)). These cookies look really good. I love brown sugar. These are definitely on the list for this weekend. But have you ever tried to bake them at a smaller size? This is what I would likely do (as well as half the recipe) :). Glad to have you back (although Todd did a great job keeping us entertained :)). Hi Anna, So sorry you’ve not been well and glad you are feeling better. I just made a variation of Torres’ ccc that turned out great, and this recipe is very similar. Would like to try it soon, am getting ready for a short trip. You don’t mention texture. Are the edges crispy? They sure look crispy in your mouthwatering photo.